Carolina marked its 223rd birthday on Tuesday with the debut of an initiative to name grants and fellowships to honor 21 people who represent important firsts in the University’s history. The need-based, undergraduate awards and graduate fellowships announced at University Day ceremonies will recognize members of the Carolina community, including Sallie Walker Stockard (class of 1898), the first female graduate who also earned a master’s from Carolina in 1900; Henry Owl ’29 (MA), the first American Indian to be admitted to UNC; and John L. Brandon, Ralph K. Frasier and LeRoy B. Frasier Jr., all of the class of 1959, Carolina’s first black undergraduates. Chancellor Carol L. Folt was inspired to launch the initiative after a suggestion made by a student at last year’s town hall on race and inclusion. Folt asked Stephen Farmer, vice provost for enrollment and undergraduate admissions, to chair a special naming committee to develop a process and recommend honorees. Committee members represented the office of the executive vice chancellor and provost; the American Indian Center; the department of African, African-American and diaspora studies; the School of Education; and the office of the vice chancellor for development. Identifying naming opportunities to honor a wider variety of notable figures in Carolina’s history is one of many initiatives underway over the past year to better promote inclusion and diversity on campus. The University plans to announce more newly named grants and anticipates additional naming opportunities later this year and in the coming years, as well as opportunities for community members to nominate possible honorees. These grants will continue to be awarded exclusively on the basis of demonstrated need. University Day convocation marks the 1793 laying of the cornerstone at Old East, the nation’s first state university building, and the birth of U.S. public higher education. Sallie Stockard was a historian, author and advocate for equal educational opportunities for women who wrote histories of Guilford and Alamance counties in the Triad region of North Carolina that are still in print. Henry Owl was a Cherokee from the Qualla Boundary. After earning a master’s degree, he was twice denied the opportunity to vote. Owl went on to champion the rights of the Cherokee, testifying before Congress and securing U S. citizenship for the people of the Eastern Band. 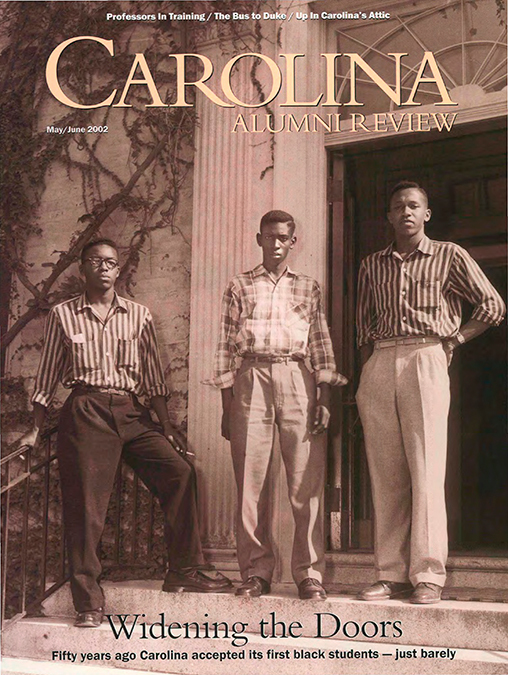 John Brandon, Ralph Frasier and LeRoy Frasier Jr. required a court order in 1955 to make it to Carolina from Durham’s Hillside High School. All three eventually earned their degrees elsewhere. Brandon served in the Navy and earned bachelor’s and master’s degrees in chemistry from the University of Houston. He later became a senior research chemist at Dow Chemical Co. Ralph Frasier graduated from N.C. Central University’s law school with honors, formed the legal department at Wachovia Bank and Trust in Winston-Salem and worked as general counsel for Huntington Bancshares Inc. in Ohio. LeRoy Frasier earned a bachelor’s degree from NCCU and a master’s from New York University. He served in the Peace Corps and taught English and English as a second language in the U.S. and Africa, including time at Hillside High. 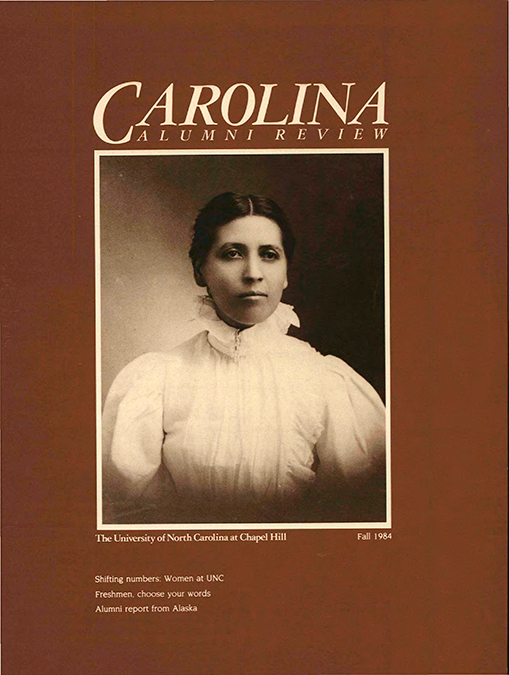 Irene Dillard Elliott ’24 (PhD) and Anna Forbes Liddell (class of 1918) and ’24 (PhD) were the first women to earn doctorates at Carolina. Elliott also was the first woman to earn a full professorship and deanship at the University of South Carolina. After retiring in 1935, she returned to USC in 1946 to teach 18 more years when the school experienced a shortage of English professors following World War II. Liddell was active in the suffrage movement in North Carolina as a young woman. In 1926, she began teaching at what is now Florida State University, where she chaired the department of philosophy and religion before retiring in 1962. Johnston Blakeley (class of 1801) was orphaned at 16, shortly after entering Carolina in 1796. He was the first alumnus to give his life in military service to the United States. While serving as a Navy captain during the War of 1812, he disappeared in action and is presumed to have died in 1814. W. Horace Carter ’43 was the editor of The Daily Tar Heel student newspaper. In 1946, he founded The Tribune in Tabor City. As a groundbreaking journalist in the 1950s, Carter campaigned against the Ku Klux Klan, resulting in more than 100 convictions of Klansmen. In 1953, he and The Tribune won the prestigious Pulitzer Prize for meritorious public service. Lenoir Chambers (class of 1914) also received the Pulitzer Prize for journalism. He was honored for his editorials, which opposed massive resistance to school desegregation. Genevieve Lowry Cole ’54 (’76 MPH), a member of the Lumbee tribe, was the first female American Indian student to graduate from Carolina. After earning a degree in medical technology, she worked in clinical labs at the University of California Medical Center and later returned to Carolina for her master’s degree in public health. She went on to a career as a microbiologist, working at both Duke and N.C. State universities. William Alexander Darity Sr. ’64 (PhD) was the first black student to earn a doctorate from Carolina, earning his degree in what is now the Gillings School of Global Public Health. Darity was founding dean of the School of Health Sciences at the University of Massachusetts Amherst and a professor emeritus . He served Carolina as a member of the Board of Trustees (1985-91) during a period that included board debate about race and inclusion issues. Richard J. Epps Jr. ’73 was the first black student elected student body president, taking office in 1972. He served as a congressional aide, an assistant director of admissions at UNC and senior trial attorney in the U.S. Department of Justice’s civil rights division. At Carolina, he served on the Board of Visitors and the UNC General Alumni Association’s Board of Directors — both as student body president and later as an elected member — and he helped establish what is now the annual Black Alumni Reunion. Santiago Gangotena ’78 (PhD) founded the Universidad San Francisco de Quito, the first private liberal arts university in Ecuador. USFQ and Carolina are partners on a joint research and education initiative focused on understanding and preserving the Galapagos Islands. Patricia Dallas Horoho ’82 became the 43rd surgeon general of the Army, the first nurse and first woman to hold the position. The American Red Cross recognized her as a “nurse hero,” and she was chosen as the USO’s 2009 Woman of the Year. Hortense K. McClinton was the first black professor hired at Carolina. After earning a bachelor’s degree from Howard University and a master’s degree from the University of Pennsylvania, she came to Chapel Hill in 1966 and spent almost 20 years in the School of Social Work, where she created and taught a course on institutional racism. Karen L. Parker ’65 was the first black female undergraduate at Carolina. She chronicled her years as a student — including descriptions of her experiences during the civil rights movement — and donated her diary to Wilson Library’s Southern Historical Collection in 2006. Parker went on to a successful career in journalism, working for The Grand Rapids Press, The Los Angeles Times and The Winston-Salem Journal. She is a past member of the GAA Board of Directors. Vermont C. Royster ’35, a former editor of The Daily Tar Heel, was a two-time Pulitzer Prize winner in journalism for his work at The Wall Street Journal, where he held many positions including editor of the editorial page and editor. His Pulitzers recognized his skill for understanding the American people and for writing commentary that put contemporary events in a historical context. His work also earned him the Presidential Medal of Honor in 1986. After retiring, Royster returned to Carolina as the Kenan Professor of journalism and public affairs. He also was a former chair (then referred to as president) of the GAA Board of Directors. Charles T. Scott ’70 was Carolina’s first black scholarship athlete. His recruitment by Dean Smith was considered a turning point in race relations in North Carolina. Not only was Scott pivotal in helping Smith integrate Carolina and the Chapel Hill community, he also led the Tar Heels to two ACC Tournament titles and two Final Fours. Scott went on to a 10-year professional career in the American Basketball Association and NBA, where he was a five time all-star. He is a past member of the GAA Board of Directors. Karen Leslie Stevenson ’79 was the first black woman awarded the Morehead Scholarship (now the Morehead-Cain Scholarship). Stevenson also was a decorated athlete, setting 14 school track records and twice winning the Jim Tatum Award for athletic and academic leadership. She was the first black woman selected as a Rhodes Scholar. After earning a master’s in European History at Oxford, Stevenson received a law degree from Stanford University and became a civil litigator in California. Patricia Wallace ’86 in 1985 became the first woman elected student body president at Carolina. She earned a doctorate in medieval studies at Cornell University and taught at Florida International University before earning a law degree from the University of Miami. Wallace became a First Amendment attorney, defending the right of free speech, and now prosecutes violations of privacy claims on behalf of women. She is a past member of the GAA Board of Directors.